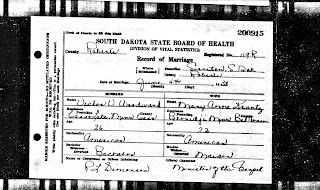 Our Grandma Mary and Grandpa Victor were Married in South Dakota - here is their Marriage License! Grandma and Grandpa were married on June 4th, 1938. Dad arrived in January of 1939 - not quite 40 weeks is it? Grandma told me that she felt pressured into marrying Grandpa Victor and that she was very, very naive about the facts of life at age 22. Victor was 26 and they eloped to South Dakota to get married. Our Mom's parents (Rev. James O. Pederson and Anna E. Pederson) also started procreation before marriage - when it came time to celebrate their 50th wedding anniversary we were surprised that they wanted no celebration. Why? Grandpa loved pomp and circumstance and Grandma loved getting the family together - turns out Uncle Gunner (our oldest uncle) was almost 9 months old when they got married! That's the way they "did it" in the old country (Norway) per Grandpa - sure, you betcha. I am kidding - but it is true - kids out of wedlock are not a big deal in Scandinavia going back a couple generations. Generally, couples did not marry until their first child was a year or two old or they started on their second child. Children out of wedlock is still very common today in Scandinavia. Grandpa and Grandma were pretty embarressed back then though - and they would be impressed/relieved that their American Grandchildren - Jan, Dave and Dan had kids in the traditional American birth order of marriage followed by children.